Despite the inevitability of it all, there were tears after River Plate lost to Barcelona. Two second-half goals from Luis Suarez complemented the opener from Lionel Messi in the Club World Cup final in Yokohama. In a game in which Barcelona could have scored several more, the European club won thanks to its South American stars. The Argentines were deflated, not by the result or performance, but more by the fact that a cycle which had gone a long way to restoring the club’s name still fell just short. The final taught us little that we did not already know. By any consideration, Barcelona are the superior side in world football. “At least we didn’t concede four like Real Madrid,” laughed the River fans. We also saw the vast gulf in quality between European and South American teams — a gulf that will never close. Critics were disappointed by River’s aggressive game plan and lack of creativity and quality. But there were few other options, because in terms of resources, there will never be parity. Neymar remembered “being taught a lesson” when he played against his current club with Santos. Now playing on the winning team in this final, he taught a lesson right back: that as great as River or their rivals Boca Juniors might become on their side of the world, there are limits to their ambitions. Those limits are written into the figures. To qualify for the Club World Cup, as Champions League winners in 2015, Barcelona took £44.4m in prize money. Winning the final brought in £7.6m alone. For the entire Libertadores Cup winning campaign, River received a total of £3.3m from the organisers. Boca this year earned even less. The cumulative effect of these levels of finance, year after year, is just one of the back stories to the game in Yokohama. Amidst the excitement in Argentina in the run-up to the final, which is felt much more by clubs representing Argentina or Brazil than those representing Spain or England, many newspapers trawled their archives to bring out the story about how Leo Messi was once on trial at River Plate. It was in 2000 when Messi and his teammate from Newell’s Old Boys, Leandro Gimenez, travelled to Buenos Aires. Current national team and Napoli striker Gonzalo Higuain also played in the practice match, in which Gimenez remembers Messi scoring between eight and ten goals. Others who were on the sidelines that day say it was as many as 15. There are many reasons given for why Messi did not sign for River Plate, all of which echo the myriad problems facing South American clubs: poor infrastructure and investment in youth teams; business interests overlapping and conflicting with directors’ interests; and the more tangible reality that a necessary hormone treatment of $700 per month, even for a player the chief scout was desperate to sign, was simply unaffordable. Regardless which reason is most true, the result is the same. 15 years on, Messi is the world’s number one player and has won his 26th title with Barcelona. Meanwhile, back in Argentina, River and Boca continue the same tired cycle of sifting out their nation's great players just to watch them disappear across the ocean. After the final in Japan, as the supporters in red and white continued to chant and sing despite seeing their side outclassed, cameras focused on the latest player set for fairer (or at least richer) shores: Matias Kranevitter. The 22-year-old had finished his last game for the club before moving to Atletico de Madrid. Along with the Uruguayan midfielder Carlos Sanchez, who turned a place on the long list for the Balon d’Or into a transfer to Mexican club C.F. Monterey, two of the key players from this River Plate team were leaving. They joined the list of other players to have already departed. Ramiro Funes Mori had marshalled defence in the Libertadores Cup, and scored in the final against Mexican side Tigres. In the stands at River, they begged their “Beckenbauer” not to leave. He went to Everton all the same. Other players — Teo Gutierrez, Ariel Rojas, Fernando Cavenaghi — also moved on. Without that backbone, River Plate face the task of rebuilding after a year that, regardless of the result against Barcelona, was historic in achievement. It was historic because it evoked the club’s legendary teams and players. In 1986, River beat Steau Bucharest in the Intercontinental Cup with Oscar Ruggeri, Neri Pumpido and Hector Enrique, three players who also started for Argentina's winning side in the World Cup final in Mexico. Ten years later, a Juventus side featuring Alessandro Del Piero and Zinedine Zidane won the same competition 1-0, but River boasted quality in the likes of Enzo Francscoli and Ariel Ortega. Playing well in such high-profile international competitions revolutionised one of South America’s great clubs. It was a long and uneven process returning to those heights, but the tournament in Japan proved worth it, as it capped a stunning period in which River Plate won the Libertadores Cup, the Sudamericana Cup, as well as a league title and both the Argentina and South America Supercups. So passionate and proud were the fans, over 20,000 made the gruelling trip from Argentina to Japan. They flooded social media with selfies, pictures admiring the space-age technology, comments about how ordered the country was and how things actually “worked”, unlike back home. They trained locals, including one young girl, to say taunts to their camera about Boca. There were stories the supporters brought with them, such as the man who had a heart attack just weeks before, Vicente Zuccala, 26 years old, who plays for the Murcielagos, the Bats, Argentina’s blind football team. There were those who had sold their car. Travelling that distance was a major outlay, even before Argentina’s already struggling economy took another hit by way of a 40% currency devaluation while the fans were away, yet still they came in their thousands. “We were remembering when we arrived at the ground for Almirante. Look at us now. We deserved this,” tweeted Federico Peretti, about the pre-match atmosphere. Peretti is a photographer and the director ofThose Colours You Wear, the film about the day River Plate unveiled an 8 kilometre long flag through the streets of Buenos Aires. Almirante is Almirante Brown, a lower league club that River played on the last day of the season in the second division in June 2012. From the team that day, defender Jonathan Maidana and midfielder Leonardo Ponzio both faced Barcelona three years later. The year in the second division was nothing short of traumatic for the club, River only securing promotion on the final day. The interim between that season and the final in Japan was vertiginous. After winning promotion, coach Matias Almeyda soon made way for Ramon Díaz. While Diaz rebuilt the side, President Daniel Passarella did not run for re-election, sensing he would be punished in the ballot box for having taken the club down a division. A new president, Rodolfo D’Onofrio, brought with him many directors who went about modernising the club, along with past players still idolised at the club, from legendary goalkeeper Amadeo Carrizo to Norberto “Beto” Alonso and Uruguayan Enzo Francescoli. When Díaz resigned shortly after winning the league title and Argentina Supercup, Francescoli, now the sporting director, opted for Marcelo Gallardo, who then led the team to a stunning unbeaten run of over 30 games, and wins over Boca on the way to winning the Sudamericana and Libertadores Cups. And then, it was on to glory and tears in Japan. Just as inevitable as the defeat in Japan was Boca’s delight in River’s demise at the hands of Barcelona. There's little love lost between the two teams, even if their plights of European pillage are the same. Part of Boca's delight must surely be due to River's stepping on its rival's turf. Victories in the Intercontinental Trophy in 2000, defeating Real Madrid, and in 2003, defeating Milan, are still fresh in the collective memory. The 1977 win over Borussia Monchengladbach less so, but three Intercontinental trophies and six Libertadores Cups back up Boca Junior’s pride in its international record. International is what Boca does. Throughout their rivalry, River have been the domestic team while Boca have won most of the international plaudits. But in 2015, the roles historically observed by both clubs were reversed. While River Plate won the Libertadores and prepared for Japan, Boca went about restoring the sporting image on the domestic front. Carlos Tevez was repatriated to the club he grew up at, helping the team win a league and domestic cup double. It was his personal second double of the year, having won the same with Juventus earlier in the year. When Tevez was formally presented at the Bombonera two months later, it was the perfect tonic. The club threw open the doors to the ground. Nobody knows exactly how many were at the stadium that day, but what is certain is that as they climbed up railings and scrambled for a view, the iconic stadium was carrying thousands more than even on sell-out matchdays. The quality Tevez brought to the team lifted Boca far and above opposing sides. At times he was irritable with teammates who picked up unnecessary bookings or gave the ball away cheaply, and there was the controversy when he went over the ball and was involved in a horrific broken leg for Argentinos Juniors midfielder Ezequiel Ham. But his charisma and class brought to Boca exactly what the club needed. Boca were by far the most consistent team in the league. They were soon celebrating the double. Seeing both clubs rise back to prominence is a great sign for football in Argentina, and indeed, anywhere. The two teams make up one of world football’s great rivalries. River Plate-Boca Juniors, and as the more politically correct Argentines are quick to say, Boca Juniors-River Plate too, is the lifeblood of Argentine football. Between them, they dispute who has more supporters, though Boca seems to edge River out by most counts. To understand just how much the two dominate the national game, simply look at the 2006 government survey that concluded that Boca and River have approximately 73% of all supporters in the country. The rivalry is as much geographic as it is, historically, along class lines. Both clubs were born in the port area of La Boca, where immigrants arrived and settled. River moved to the north of the city in search of land to build its own stadium, which resulted in the Millionaires, so-called because of the outlay on players in the 1930s. At the time, it was known to locals as Siberia for its remote location. Now, the neighbourhood next to the stadium is called barrio River, taking its name from the club. But River's and Boca's hegemony in the 1990s and 2000s has resulted in both sides developing a nationwide support base that transcends income and class and is simply the culture of the aguante, which is supporting the team no matter the result. Nowadays, both clubs’ coaches are young and bring modern ideas to their teams. Marcelo Gallardo’s River played some stylish football in the first months of his tenure, before allowing pragmatism to dictate the far more robust style on show against Barcelona. Roldolfo Arruabarrena’s Boca, in turn, were far more complex than merely physique and fight as they won the double. No amount of blurred lines, though, will ever ease the tense rivalries between Argentina's two giants. 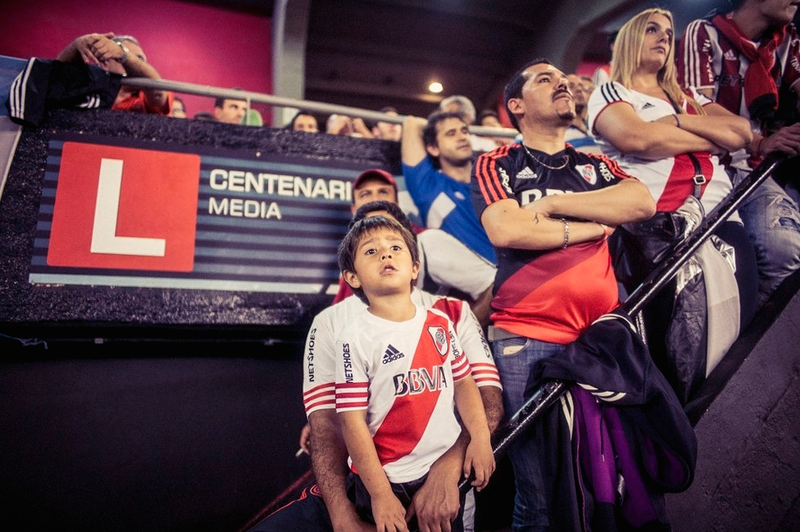 What lies ahead for River and Boca, and the superclásico as an institution itself, is the question over how the clubs modernise off the pitch. Both club’s stadiums are old and need urgent restructuring work, and an endemic problem of violence means there are no away supporters at games. Directors at River are working to control the spiralling debt. To do so, they are at long last looking to maximise merchandising and marketing, and in particular, have begun exploring the idea of taking on a sponsor for the Monumental. At Boca, the club president Daniel Angelici recently won re-election. Tevez and the league and cup double were his trump cards. But he too faces stadium difficulties. Boca have thousands more members than capacity — so too do River — leading to major ticket problems. The residents behind the Bombonera have so far refused to sell to the club, leading to Angelici floating the idea of building a brand new 90,000 capacity next to the Bombonera, and thus leaving the historic ground, just River did decades ago. In March or April, the club members will be asked to vote to decide. Adding to this uncertainty is the uncertainty of the nation itself. 2015 was a year of chaos and change, in which Argentina defaulted on its debt and changed its political leadership for the first time in 15 years. The nation elected a new president — Mauricio Macri, who coincidentally once served as president at Boca. The Argentina FA, somewhat clumsily after a failed first vote produced 76 votes from 75 representatives, also voted in a new president. Though it may be an affront to history and tradition, accepting change in the nation and in the clubs is the only way either can survive. A stadium name sponsor or moving to a new ground would generate the kind of income that permits clubs to develop a squad able to challenge on the highest stage. Looked at that way, it's a small price to pay to keep the Argentine football dream alive. Our Derbies Issue has sold out, but you can get the digital edition by becoming a member. Derbies are the games us football fans live for. There's nothing quite like the tribalistic battle for local supremacy and, for fans, it doesn't matter if you're fighting for a league title or against relegation – you just need to win that derby. In this issue, we explore 5 derbies in depth: River Plate vs Boca Juniors, Borussia Dortmund vs Schalke, Roma vs Lazio, Galatasaray vs Fenerbahce and the lesser known Brazilian derby, Sport vs Santa Cruz. There is also a cover interview with Paris Saint-Germain and France star Blaise Matuidu, and his French team-mates Raphael Varane and Mamadou Sakho, plus we talk exclusively to Liverpool striker Roberto Firmino, England women's coach Mark Sampson and go behind-the-scenes at Raul's final game as a professional for New York Cosmos. Benito Mussolini was a man who usually got his own way. But when his hopes of building a single football team in Rome to take on the supremacy of the teams in northern Italy were scuppered by Lazio, who refused to join forces with three other local teams to form AS Roma in 1927, a rivalry was born. Since then, the Derby della Capitale has been punctuated by violence and riots. It's safe to say it remains the fiercest in Italy. Having fallen behind Bayern, Dortmund visited Hertha, hoping a first league win there since 2014 would return them to the top of the Bundesliga. Ryan Hunn reports from an epic encounter at the Olympiastadion.